Before you can get to the excitement (I use that term loosely) of the Boys of Summer, you first get the Girls of Spring. The Girls of Spring are specifically two wonderful blonde scruffy ladies; me and Harriet. The Arizona Humane Society does an annual event at a spring training game called Dog Days at the Park. 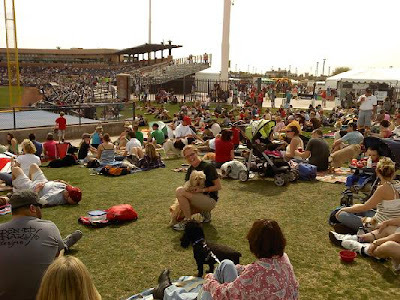 A section of the lawn is set aside for people to bring their pets. 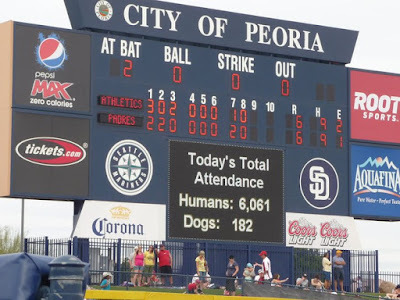 Each dog has to buy a ticket as a fundraiser. 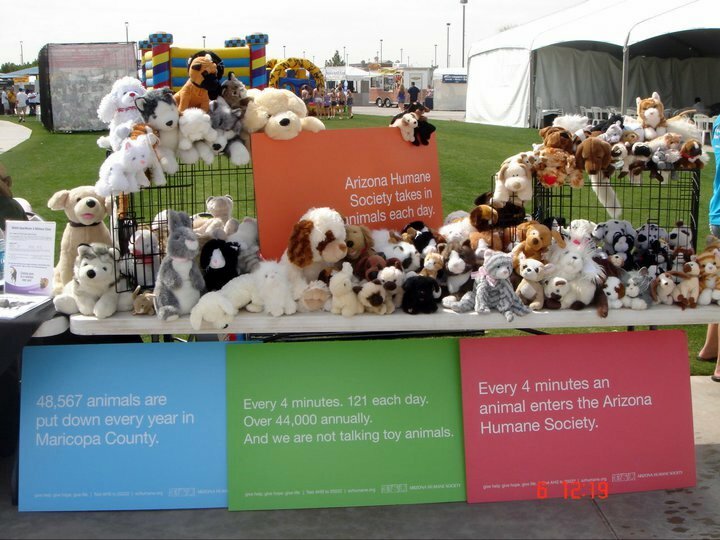 The AHS sets up an info booth and this year they were making a special push to recruit new foster homes. 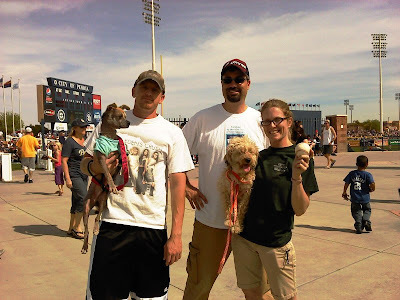 I volunteered us to be one of the Fabulous Foster teams at the game to talk to people about how great fostering is. Harriet, as always, was happy to go along. As part of the Humane Society's perks of the game, they get to have one of their dogs throw (I use the term loosely) out the first pitch. There were five foster dogs there, three tiny ones, Harriet and a border collie. The border collie was originally chosen but he got nixed because he was being held for the Fashion Show event. That means that the general public wouldn't be able to adopt him. Harriet, was slated for the kennels and general adoptions, plus she was done with her foster time so would be adoptable that week. So, Harriet and I got to throw (still using that term loosely) out the first pitch! Last year the dog peed on the pitcher's mound. My fosters would never do something so uncouth!! 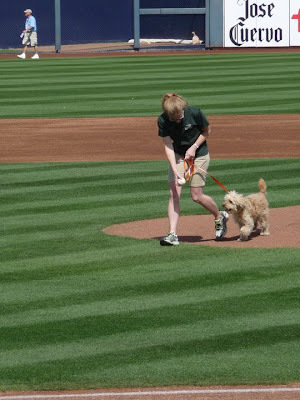 On the pitcher's mound: Last year's dog was a big Lab and he actually did carry the ball to the mound. Though she was better at not-peeing than last year's dog, she wasn't able to live up to his glory and I had to carry the ball for her. 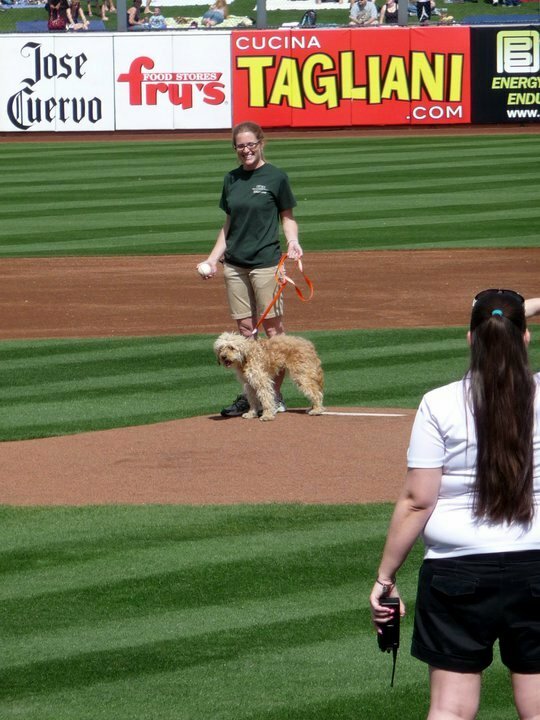 This is why I use the term "throw" very loosely....throwing out the first pitch: Despite the fact that Harriet didn't actually do anything, the whole crowd applauded like she was the most amazing superstar dog they had ever seen. It was awesome! As we were leaving the field, we passed by the umpires. We had to stop when one of them started calling Harriet's name all squeaky-like and got down on his knees to play with her. It was adorable. 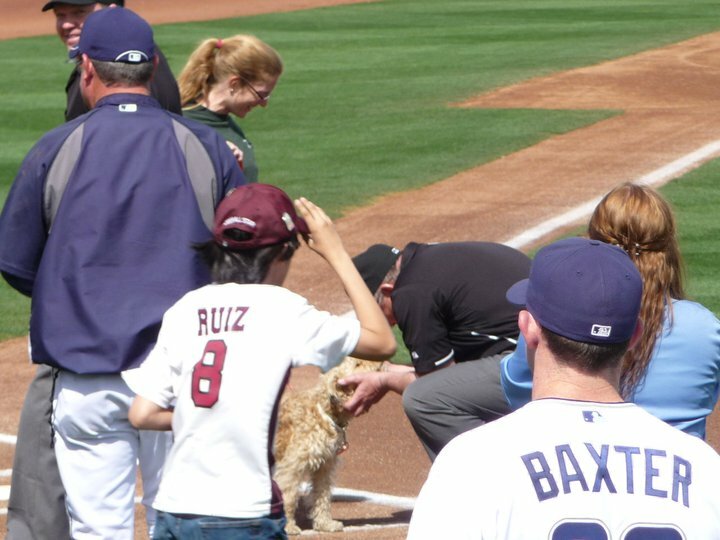 It's not very often that there is a slight game delay because an umpire needs to pet a puppy! Harriet was thrilled to make his official acquaintance. This Padre player gave me the ball to keep. I don't know who he is. Anyone recognize him? Is he someone super-famous? Maybe I had a brush with fame! What am I talking about? I don't need a brush with fame. I'm super-famous in my own right! I just got to throw out the first pitch at a MLB game! I'm famous! See? Here are all my fans: Here are more of my fans and all their doggies. They are all respectfully pretending that we are part of the common people and not bothering us for our auto/pawtographs. 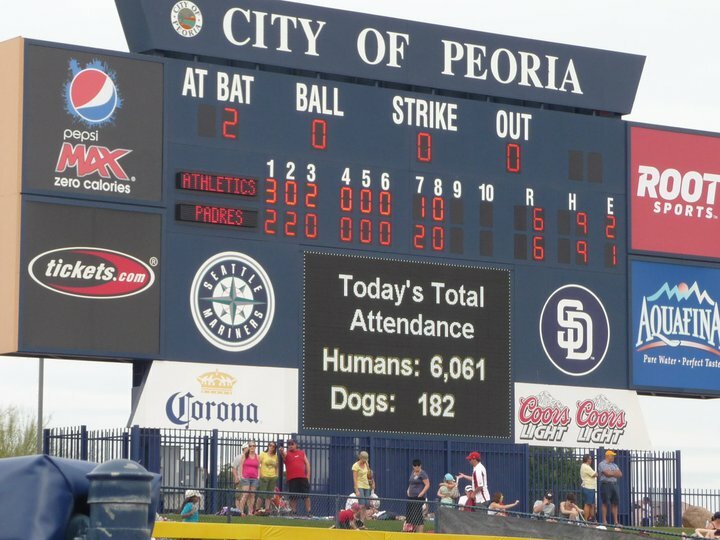 Final Attendance: The morale of this story is: BECOME A VOLUNTEER! You get good perks! Fame Points = 30 seconds. I now have 14 minutes left! Hello! I'm so excited I found your blog! I volunteer at a local shelter and blog about it too. Our shelter desperately needs help. Fundraisers and advertising of the dogs- hopefully I'll get some ideas from you. I'm limited on time but I'll do what I can.